Grab your Besties.... It's Mimosa Time! Looking for different type of gift to get your girls? Having mimosas while you’re getting ready on your big day but TERRIFIED they’ll spill on the dresses? Look no further than this insulated stemless wine glass, thoughtfully donated to us for a trial run by Groovy Guy Gifts. These tumblers are SO cute- the perfect gift for your bridesmaid besties! Aren't they adorable!? Thermal Insulation: I can personally attest that this kept my coffee hot for over 3 hours, and my mimosa cold for about 3 (I was super thirsty). My second mimosa stayed cold for hours! Shape: Your standard stemless wineglass with some extra thickness due to the thermal insulation. BE WARNED! I tried to take this in the car with me while it was holding my morning coffee, and it does not fit in a standard car cup holder. Don’t be reckless like me and try to make it fit anyway, because at one point in your drive you will stomp the break, the wineglass will roll forward several times, and there will be coffee in your car. Top and Straw: You read right, this baby comes with its own straw. Definitely use it! While the removable top of the wineglass has a great seal on it, the sliding closure on the mouthpiece does not and is prone to leaks. The mouthpiece is also quite small, so your sips without the straw will be little too. Do yourself a favor and keep that straw handy! 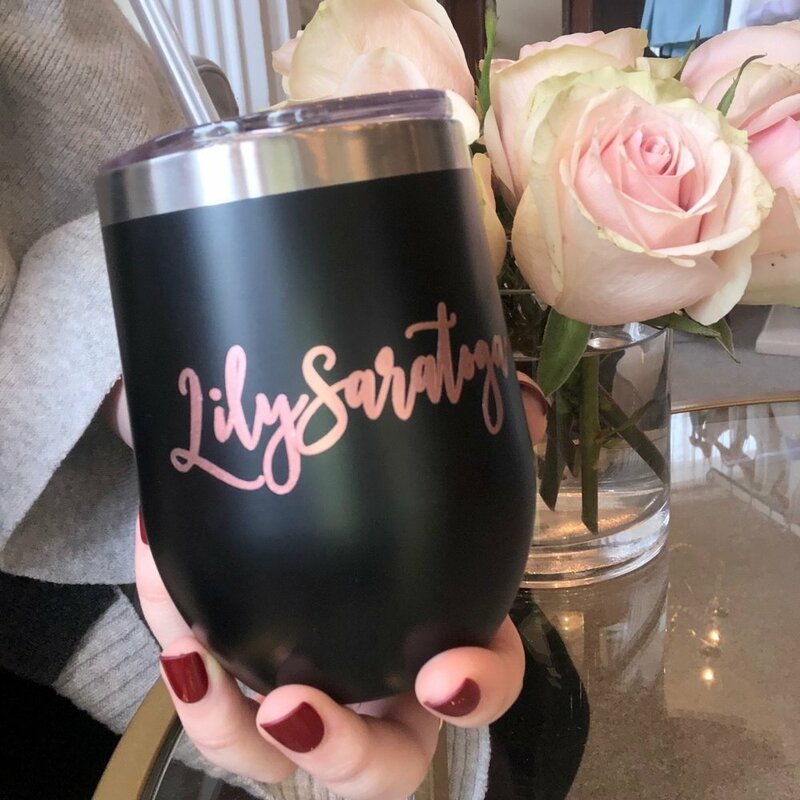 Personalization: Our stemless wineglass came with a matte black outer shell and totally awesome sparkly rose gold “Lily Saratoga” script on the front. You are able to choose from 5 different shell colors and 7 script colors. While the script is an application on the glass, as opposed to an engraving, it held up well over several uses and I didn’t see any wear or tear on our sparkly name. your ladies will be able to see their personalized glass from across the room! Care: Hand wash only on these beauties, like most insulated glasses. Plus taking gentle care will help keep your personalization fresh and clean for ages! No doubt this stemless wineglass would make a fantastic gift for your bridesmaids, your weekly girls brunch, or anything else you would want insulated stemless wineglasses for. And let's not forget the guys! If you're looking for unique personalized groomsmen gifts, check out Groovy Groomsmen Gifts. This online shop will have everything you need for all of the men in your wedding party. Just be sure to keep hold of them in your cars and use those straws! Cheers! Pricing: $30/ glass with free shipping on orders of $75 or more. A little Valentine's Day Surprise..